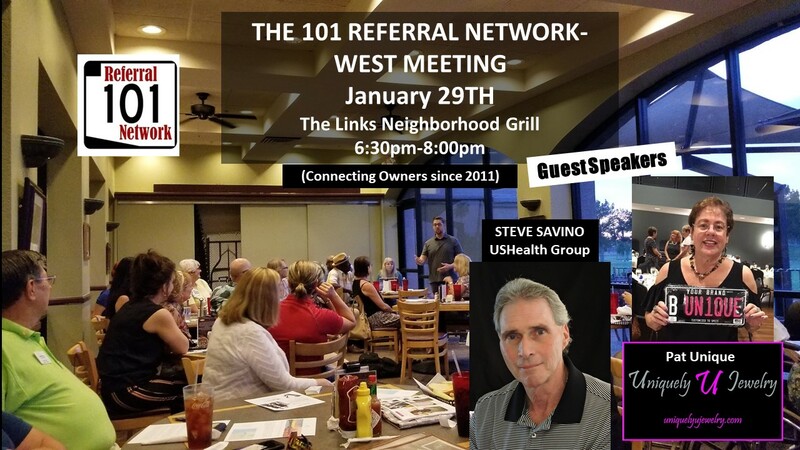 We’re so excited to bring you our January meeting for The 101 Referral Network-West group Tuesday at The Links Neighborhood Grill. It’s been newly remodeled and is beautiful! We have Steve Savino of USHealth presenting. Learn about the many insurance services his company offerrs AND Pat Unique of Uniquely U Jewelry. SOCIAL MEDIA TIPS – will be presented by Shelley Marie of Shelley Marie SMD – The Social Media Diva. She’ll be sharing some great tips about facebook that will enhance your business. Please plan on ordering something from the menu so we can continue to have this beautiful facility available to hold our West side meetings. It’s TACO Tuesday – an entire meal for only $5! Beer and wine is available!